The economic crisis requires a radical response--not revved-up consumerism. 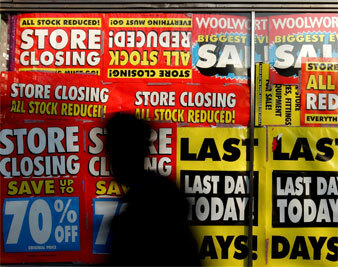 AP Images Along with recession comes a struggle for the soul of capitalism. But it is hard to discern any movement toward a wholesale rethinking of the dominant role of the market in our society. No one is questioning the impulse to rehabilitate the consumer market as the driver of American commerce. Or to keep commerce as the foundation of American public and private life, even at the cost of rendering other cherished American values–like pluralism, the life of the spirit and the pursuit of (nonmaterial) happiness–subordinate to it. Economists and politicians across the spectrum continue to insist that the challenge lies in revving up inert demand. For in an economy that has become dependent on consumerism to the tune of 70 percent of GDP, shoppers who won’t shop and consumers who don’t consume spell disaster. Yet it is precisely in confronting the paradox of consumerism that the struggle for capitalism’s soul needs to be waged. The crisis in global capitalism demands a revolution in spirit–fundamental change in attitudes and behavior. Reform cannot merely rush parents and kids back into the mall; it must encourage them to shop less, to save rather than spend. If there’s to be a federal lottery, the Obama administration should use it as an incentive for saving, a free ticket, say, for every ten bucks banked. Penalize carbon use by taxing gas so that it’s $4 a gallon regardless of market price, curbing gas guzzlers and promoting efficient public transportation. And how about policies that give producers incentives to target real needs, even where the needy are short of cash, rather than to manufacture faux needs for the wealthy just because they’ve got the cash? Or better yet, take in earnest that insincere MasterCard ad, and consider all the things money can’t buy (most things!). Change some habits and restore the balance between body and spirit. Refashion the cultural ethos by taking culture seriously. The arts play a large role in fostering the noncommercial aspects of society. It’s time, finally, for a cabinet-level arts and humanities post to foster creative thinking within government as well as throughout the country. Time for serious federal arts education money to teach the young the joys and powers of imagination, creativity and culture, as doers and spectators rather than consumers. Of course, much of what is required cannot be leveraged by government policy alone, or by a stimulus package and new regulations over the securities and banking markets. A cultural ethos is at stake. For far too long our primary institutions–from education and advertising to politics and entertainment–have prized consumerism above everything else, even at the price of infantilizing society. If spirit is to have a chance, they must join the revolution. The good news is, people are already spending less, earning before buying (using those old-fashioned layaway plans) and feeling relieved at the shopping quasi-moratorium. Suddenly debit cards are the preferred plastic. Parental “gatekeepers” are rebelling against marketers who treat their 4-year-olds as consumers-to-be. Adults are questioning brand identities and the infantilization of their tastes. They are out in front of the politicians, who still seem addicted to credit as a cure-all for the economic crisis. And Barack Obama? We elected a president committed in principle to deep change. Rather than try to back out of the mess we are in, why not find a way forward? What if Obama committed the United States to reducing consumer spending from 70 percent of GDP to 50 percent over the next ten years, bringing it to roughly where Germany’s GDP is today? The Germans have a commensurate standard of living and considerably greater equality. Imagine all the things we could do without having to shop: play and pray, create and relate, read and walk, listen and procreate–make art, make friends, make homes, make love. There are epic moments in history, often catalyzed by catastrophe, that permit fundamental cultural change. The Civil War not only brought an end to slavery but knit together a wounded country, opened the West and spurred capitalist investment in ways that created the modern American nation. The Great Depression legitimized a radical expansion of democratic interventionism; but more important, it made Americans aware of how crucial equality and social justice (buried in capitalism’s first century) were to America’s survival as a democracy. President Obama certainly inspired many young people to think beyond themselves–beyond careerism and mindless consumerism. But our tendency is to leave the “higher” things to high-minded rhetoric and devote policy to the material. Getting people to understand that happiness cannot be bought, and that consumerism wears out not only the sole and the wallet but the will and the soul–that capitalism cannot survive long-term on credit and consumerism–demands programs and people, not just talk. The convergence of Obama’s election and the collapse of the global credit economy marks a moment when radical change is possible. But we will need the new president’s leadership to turn the economic disaster into a cultural and democratic opportunity: to make service as important as selfishness (what about a national service program, universal and mandatory, linked to education? ); to render community no less valid than individualism (lost social capital can be re-created through support for civil society); to make the needs of the spirit as worthy of respect as those of the body (assist the arts and don’t chase religion out of the public square just because we want it out of City Hall); to make equality as important as individual opportunity (“equal opportunity” talk has become a way to avoid confronting deep structural inequality); to make prudence and modesty values no less commendable than speculation and hubris (saving is not just good economic policy; it’s a beneficent frame of mind). Such values are neither conservative nor liberal but are at once cosmopolitan and deeply American. Their restoration could inaugurate a quiet revolution. The struggle for the soul of capitalism is, then, a struggle between the nation’s economic body and its civic soul: a struggle to put capitalism in its proper place, where it serves our nature and needs rather than manipulating and fabricating whims and wants. Saving capitalism means bringing it into harmony with spirit–with prudence, pluralism and those “things of the public” (res publica) that define our civic souls. A revolution of the spirit.